I’ve sent you a friend request and of course your on my limited profile. I find this discussion interesting because there’s a fine line between having a personal persona and a professional persona. I go back and forth on this idea, but I believe that they are really one in the same. The way I am at work is often reflected by the way I am when I’m not at work and vice versa. The reality is, many folks create an artificial “professional” persona that masks who they are in the “real world”. It has been my experience that employers and co-workers can usually tease out trends in your real life personality and spot the fake portions of the professional persona. What’s left is really something closer to your personal persona. So why not just present that first and save everyone the time? On the other hand, even aside from the potentially problematic posts and tags from others, many people put their religious beliefs and political leanings on their Facebook profiles, and many businesses want to keep politics and religion out of the workplace. You don’t typically put that information on your business card. LinkedIn doesn’t have anything in its personal profiles that would indicate religious or political persuasion, unless of course you have worked vocationally in religious or political pursuits. For Facebook to be an effective business alternative to LinkedIn (I use both Facebook and LinkedIn, but Facebook to a much greater extent), it needs to duplicate this functionality. That was the point of Facebook 210 and the subsequent SMUG Research Project; creating an example of how you can avoid broadcasting this personal information to co-workers, customers or clients, but yet share it with your non-work friends. SMUG students who read my post on religious podcasting have a window to my theological beliefs, and because of my previous career information (which is available on both my LinkedIn and Facebook profiles), they would correctly infer my political sympathies. (Hint: I don’t have a direct psychological stake in the outcome of tomorrow’s Pennsylvania contest between Sen. Clinton and Sen. Obama.) Which leads me to reiterate that the views expressed on this blog are mine, not those of my employer. So Erik is right to a point; maintaining a sanitized professional persona may not be consistent with the ethic of transparency. One might even call it a matter of integrity in the literal sense. Integrity means being a single person, not having a compartmentalized life. If you’re maintaining a professional profile on LinkedIn and a personal one on Facebook, with completely different friends, you’re already creating this division. Facebook 210 just tells you how to create that separation on a single platform. I think the key to what Erik says is that a professional persona shouldn’t “mask” who you are in real life. But there’s a difference between hiding information about yourself and not actively promoting things that might be stumbling blocks for some acquaintances. To conduct research that advances our understanding of the business applications and implications of social media. In Facebook 210: Professional Profiles, Personal Privacy I offered guidance for people interested in using Facebook for one-stop personal and professional networking. Now I’m inviting all SMUG students and others who are interested to join me in testing those recommendations so we can learn together whether Facebook’s variable privacy settings make it safe for both kinds of networking. Please do check out that course for the full rationale, but here’s the short version of my recommendations for how you can use Facebook’s variable profile access settings to minimize the risk of having your co-workers, supervisors, customers, clients or other professional associates (such as journalists for people working in PR) stumble upon something on your Facebook profile that would be potentially embarrassing or unprofessional. For your existing Facebook friends, add any of your professional associates of the types described in the paragraph above to this “Professional” list. If you don’t know how to create these exceptions, check out slides 11 and 12 of the Facebook 210 presentation. I think these settings will alleviate 99 percent or more of the possible problems anyone might experience by doing their personal and professional networking on the same site. But let’s find out! If you add me as a friend, I will do likewise to you. I’ll make you one of my Blog Friends, which is a list I have set up with the same profile limitations as my Professional friends. Then you can see for yourself if anything about me that shows up in your Facebook News Feed is potentially problematic. I’ll do the same for you. I would really like to find out whether using these settings can prevent your personal Facebook activities (and those of your less-professional friends) from causing work-related problems, and I hope you will help. So I’m starting a research project. Please go to the SMUG group in Facebook, and join the discussion board on this topic. Indicate your willingness to participate, and then all of us can add each other as limited access friends. Hopefully, we’ll get a critical mass of friends in this class, so we can look at each others’ profiles and watch our news feeds, and see whether we run across anything that could conceivably have career-threatening implications. I’m betting that with these settings as I have described above, we’ll be just fine. I’m not doing a $100 SMUG challenge as I did with Secret Groups; let’s just call this a metaphorical bet. But maybe we’ll see some additional tweaking that might be necessary. And after a month of so of not having any problems (or after having made adjustments that we find are advisable), we may have a set of Professional Privacy Best Practices that would enable people to use Facebook for both personal and professional networking. Then you will be able to fearlessly invite your co-workers, customers, clients and other professional associates to be your Facebook friends, and will be able to use the collaboration power of Facebook to enhance those relationships and to enable you to work more effectively together. You’ll have closer relationships and provide better service. In this way, I hope SMUG can add to the academic body of knowledge about social networking, and can practically contribute to society by helping to drive adoption of a single multi-purpose platform for networking. My research thesis is that Facebook can be that common platform. Let’s see if we can prove or disprove that thesis. Perhaps this could be project in which the Society for New Communications Research could participate. I also will be trying to connect with others who have an interest in this issue of personal vs. professional networking. If you know people with such an interest, I hope you will invite them to join the research project. Note: This post is part of the Facebook curriculum at Social Media University, Global. I have written previously that the ability to segregate personal and professional friends in Facebook will be essential to its growth into the all-purpose social and business networking platform. I also said this separation was logically required if Facebook is to accomplish its goal of accurately representing real-world relationships in the online environment. The reality is not all friends are the same. But that only accomplished half of the goal: grouping is great, but the real need was to have different privacy settings that enable users to fully engage in Facebook personally and professionally without worrying about their work colleagues or customers getting “too much information” about their past or present extracurricular activities. What if a high school friend writes on your Wall and calls you by a nickname you’ve tried to put in your past? Or a college buddy tags you in a picture that you now find embarassing? The only solution was a single limited profile. About a month or so ago, Facebook took the next step by enabling users to specify different privacy settings for particular groups or individuals. At the time, however, some users said the settings were hard to figure out. And I was busy at the time with launching a new work-related blog, so I didn’t have time to work with it. How I have implemented these privacy controls to create an all-purpose networking site on Facebook, including the rationale for which portions I have made off-limits to professional friends. Join Facebook if you haven’t already done so, and enroll in SMUG by joining this group. Add me as a friend. 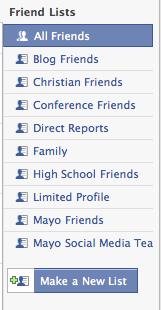 I will add you to my “Blog Friends” list, which has the same privacy settings as my “Professional Friends” list. Create your own “Professional Friends” or “SMUG Friends” list in Facebook, and adjust your Privacy settings either according to what I’ve done, or in a way that makes sense to you. Add me to that list. Send me an e-mail message when you’re created that list and adjusted your privacy settings, and I will reply and send you a screen shot of your Professional profile in Facebook. In this way, Facebook can be both your souped-up Rolodex (and the way you represent your personal brand on the Internet), while still allowing you to make personal, non-professional connections. LinkedIN, by contrast, only allows one kind of connection: professional. What do you think? How would you adjust your privacy settings for professional networking in Facebook? Are there still elements in Facebook you would like to be able to make off-limits to professional colleagues and customers?